At first look, this photo seems to be just a mirage of abstract colour and shapes. However, when you look closely (and this is achievable only if you have a zoom camera or you stand up on a high ladder), it is actually a painting on the ceiling. Yes, this is one of those paintings of the olden days that were painted on the ceiling! This photo was taken just the other day when I was visiting the Palace of Versailles in France (château built in 1623). The Palace of Versailles has over 700 rooms for Louis XIV and it is a huge palace full of history and magnificent artwork. While this painting is not an actual abstract art piece, it looks quite abstract if you don’t look too closely at what is actually being depicted by the artist in the drawing. 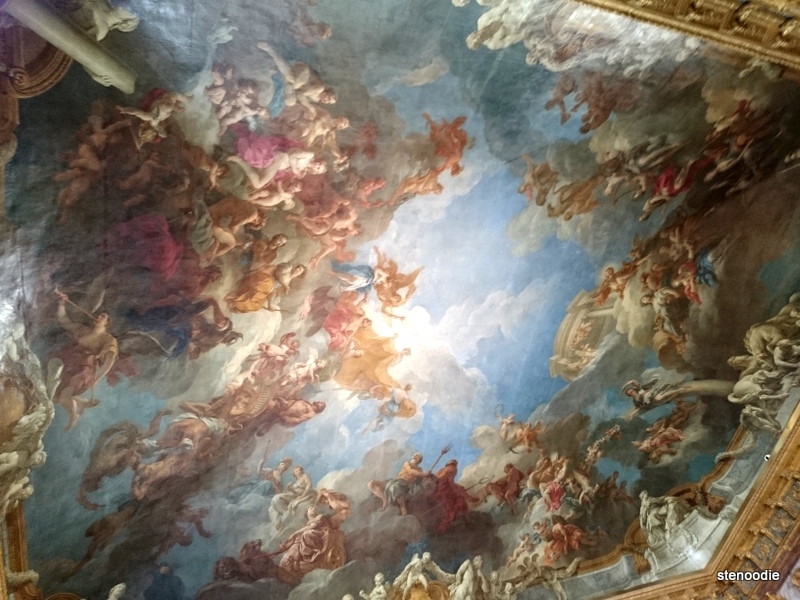 This entry was posted in Weekly Photo Challenge and tagged artwork in Versailles palace, Île-de-France, ceiling, ceiling art, ceiling artwork, château, France, French artwork, history, Louis XIV, Palace of Versailles, postaday, the artwork in Versailles, Versailles, weekly photo challenge. Bookmark the permalink. Haha, you wondered correctly ^_^.